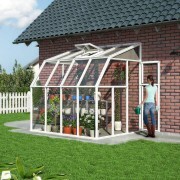 Whether you wish to enjoy the natural relaxing warmth of the sun, or a practical space-saving attached lean-to style greenhouse, the Rion Sun room is affordable and attractive. The Rion Sunroom does it all. Rion Sunroom with its durable high-strength resin frame is proven to handle large snow loads, high winds, and wear and tear easily. 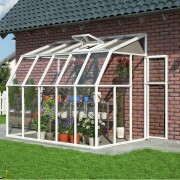 Manufactured with combined opaque 4mm twin- walled polycarbonate panels on the roof sections and clear acrylic panels on all the sides. The opaque roof protects you from the sun above, while the clear acrylic sides provide over 90% transmission of sun light to your room. The clear acrylic provides perfect clear viewing from inside and out so you can enjoy relaxing and looking out to your garden. 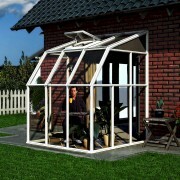 Large Garden Sun Room 6′x10′ Outdoor Living enclosed sunroom with an easy DIY installation. Open your home to the outside and create a space that can be enjoyed throughout the year and expanding the possibilities for entertaining, gardening or as a relaxation room. Discover the simplest way to tu..
Garden Sun Room 6′x8′ Outdoor Living enclosed sunroom with an easy DIY installation. Open your home to the outside and create a space that can be enjoyed throughout the year and expanding the possibilities for entertaining, gardening or as a relaxation room. Discover the simplest way to turn y.. Outdoor Living enclosed sunroom with an easy DIY installation. Open your home to the outside and create a space that can be enjoyed throughout the year and expanding the possibilities for entertaining, gardening or as a relaxation room. 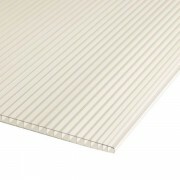 Discover the simplest way to turn your existing porch, deck ..